LOADS OF FUN AND CULTURE! 9:00 to 10:15 a.m. SPANISH LANGUAGE CLASS AND CONVERSATION: campers are taught new vocabulary and language structures (based on their level of linguistic competence), which will be used throughout today’s “Guided Conversation” activity. 10:15 to 10:30 a.m. SNACK: Fruits, cookies, muffins, crackers, juice and water (please see the “Camp Menu” link for more detailed information). 10:30 to 11:00 a.m. CIRCLE TIME AND PRESENTATION : Everyday a different subject related to the geography, fauna, history or culture of a spanish speaking country or region is presented to the students. 11:00 to 11:45 a.m. 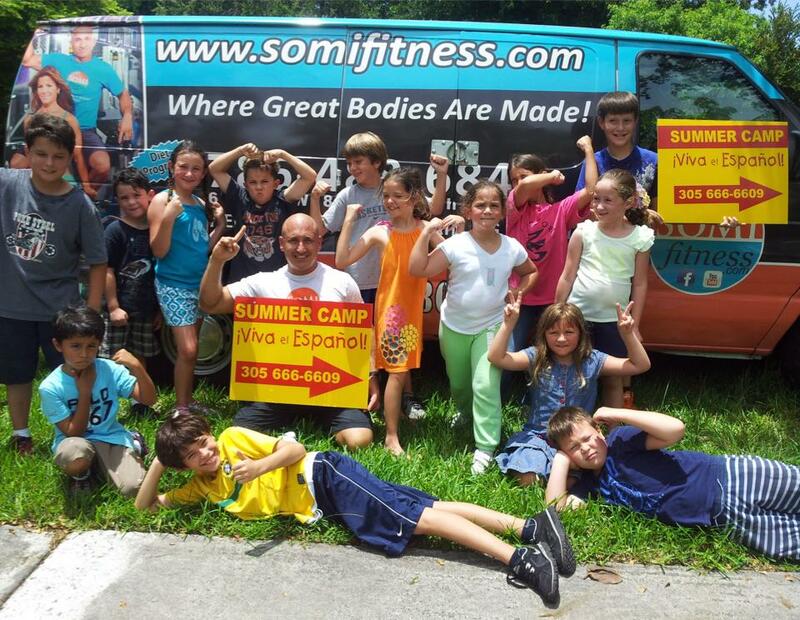 OUTDOOR ACTIVITIES : Water-play (bring your bathing suit & towel), fitness, dodge ball, shuttle runs, relay races, jump rope, capture the flag, soccer, basketball and more with the coaches of SOMI FITNESS GYM of South Miami..
11:45 to 12:30 p.m. ARTS AND CRAFTS (please bring an old t-shirt). Let’s go creative and use our hands and imagination! 12:30 to 1:00 p.m. LUNCH TIME: Our lunch (optional) includes a meal with fruits, dessert and juices. Tuesdays & Thursdays are Power Pizzeria days! For details about the meals served on Mondays, Wednesdays and Fridays, please check the “Camp Menu” link. 1:00 to 2:00 p.m. INDOOR ACTIVITIES : Singing, dancing, board games, bingo, card games, etc. Just before release time, prizes will be awarded for effort and participation.